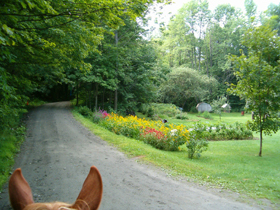 The CSTR annual June ride is an unjudged, open pleasure ride, affiliated with New England Horse & Trail Association. Mileage: Saturday’s trail will be 15 to 20 miles and Sunday will be 10 to 12 miles. There will be NO driving. Bring your own horse & people water. Everyone in camp must be registered with the ride and pay the fee. Registration is for the weekend only. Welcome Pizza Party on Friday evening at 7 pm to which all are invited - The Welcome Party is included in the entry fee. All entrants must be familiar with rough camping. There will be no hookups and no stabling. It is recommended that if your horse is unfamiliar with camping out, that you practice beforehand. Chemical toilets and a dumpster will be available, but campers must provide their own overnight sleeping arrangements. $10 Cancellation fee if cancellation received before June 1 - No refunds after June 1 unless space is filled.